The Sun Also Rises - I went out to the beach with this book, expecting to hate it and only be out for about twenty minutes. So I had no sunscreen on. Four hours later I stumbled back to the house and spent the rest of the week whimpering under damp washcloths and a thick layer of aloe, but I sure did love that book. The Color Purple - there are very, very few school books that I later reread because I loved them so much but this is one. I love the line about how It makes God mad when you walk past the color purple in a field and don't notice it. The Lord of the Flies - I only very recently (last week!) discovered what the title means. The Lord of the Flies is the God of the Underworld, because dead bodies have flies on them. This is one of the few books for school that I read and loved so much, I pushed it on my little sisters before it was required reading for them. One of them claims it as one of her top five books of all time! A Separate Peace - how I cried at the end of this book! I was so invested in the characters and the setting and this book felt so real and so alive to me. 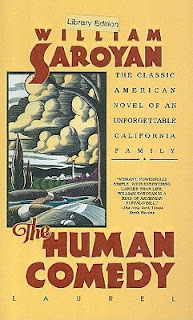 The Human Comedy by William Saroyan - I loved this book. It felt sweet and kind although it was dealing with major topics, and I felt like I was extra-smart when I got allegorical references to The Odyssey (which I hadn't read at that point yet so I'm sure I missed more than I got.) This may sound weird but the characters to me seemed like characters from a Beverly Cleary book, but older. They felt real and authentic, but I liked how their lives were ordinary and not filled with constant bad things, like many other books we read at that time seemed to be (Dickens anyone?) I picked up a copy a few years ago (this one was in our Literature textbook and in fact, I'm not sure but I may have read an excerpt and not the whole book) and I really should reread it and see if it's as wonderful as I remember. I think Lord of The Flies made me a writer. We were forced to read A Separate Peace in high school. Still don't know what was so great about the book. Still don't remember if that guy was pushed out of the tree or not. I actually think one of the only books I WASN'T as keen on was The Color Purple - sacrilege, I know! Still, I'd probably not have picked up any of the novels we studied for years and years otherwise, so I'm very grateful to my English teachers for introducing me to these authors so early on.